Had enough of “super groups” and projects yet? No? Well, good for you because here comes another one for you, peeps. In this case we get a classic power trio, formed by guitar player Vinnie Moore (ex-Alice Cooper, UFO), lead vocalist Kelly Keeling – who also takes care of bass duties (ex-Baton Rouge, John Norum, Blue Murder, MSG) and drummer Scot Coogan (Brides Of Destruction, Ace Frehley, Lita Ford). To even call this a super group is really exaggerated by large. Yes, super, when you think of the members’ musicianship, they’re all on top of the game when it comes to handling their instruments, but it’s not like they’re common knowledge, not even for hard rock fans. But they really should be. Vinnie Moore has to be the most well-known of the bunch after his stint in Alice Cooper’s band and as he now is a member of UFO, but Kelly Keeling and Scot Coogan really must be seen as unknowns. Keeling’s first band Baton Rouge were a really underrated melodic hard rock band that released two great albums, Shake Your Soul (1990) and Lights Out On The Playground (1991), but nothing really came out of that. His involvement with John Sykes’ Blue Murder was only a one song on one album thing (Nothin’ But Trouble, 1993) and his two records with Europe guitar player John Norum (Another Destination, 1995 and Worlds Away, 1996) never really went anywhere. The same thing happened with MSG – the two records, The Unforgiven, 1999 and Tales Of Rock ‘n’ Roll (2006) didn’t exactly ship multiple platinum. Coogan made a really good job as a touring drummer for Ace Frehley and Lita Ford, but few took notice of the drummer in those bands and the band Brides Of Destruction’s – that was formed by Nikki Sixx (Mötley Crüe) and Tracii Guns (L.A. Guns) – albums Here Comes The Brides (2004) and Runaway Brides (2005) fell flat on their backs, the latter was nothing but useless crap. I understand that their record company tries to sell this with the supergroup tag, but I don’t think that will work. However, for people like me – who really likes all three band members – really had to check out this album. Especially as a fan of Keeling, who has been absent from the music scene for many a year now, this was a long-awaited come back. For you who don’t know Keeling, I have always thought that his voice sounds like a good mix of Sammy Hagar and Paul Shortino (Rough Cutt, King Kobra). I’m a huge fan of both! With no expectations what so ever, I plug my earphones into my iPhone to get a blast from this new three-piece. “Hell No” runs me over on the spot with an addictive groove and some major Led Zeppelin influences. A great opener that tells us that these guys really masters groovy 70’s hard rock like a charm. “By The Rainbow’s End” also runs with the Zep foundation and has a heavy groove, a brilliant melody and a killer chorus. “House Of Light” takes a turn into the blues with good dose of soul, but still rocks me good and leaves me with an enamoured smile on my face. We get a ballad in “Cloud Of Dreams”, but there’s no cheese here to be found. This is not a power ballad, this is a blues ballad, very emotional and full of feel and passion – love it! I hold “Save It” as one of my personal favourites here, a swinging soul – rocker that reminds me of Richie Kotzen’s solo stuff. With “Never Trust A Woman” we get some dirt under our finger nails, a more rough and dirtier sounding song, almost a bit dishevelled – and I love it. “Obvious” reminds me a bit of when Keeling was fronting Norum’s band, only better. It’s a slow rocker and Norum would have (at least he should have) killed for a song like this on his Keeling-fronted records. “Hit The Road” is a total killer, a flabbergasted rock jam that swings and grooves like crazy. Fantastic! I won’t lie to you, this album contains the odd filler or two, but do not let that deter you from giving this a chance because most of the record is good – really bloody great, in fact. Again, in the sense of their musical ability, this really is a super group, a super trio with as much class and quality as the highly rated Winery Dogs (Richie Kotzen, Billy Sheehan, Mike Portnoy) and they really know their groove splashed seventies hard rock inside out. The swing and groove are striking and conspicuous and the rhythm section of Keeling and Coogan really has a good thing going on here. Never knew Keeling – who still has a voice and a range to die for – could handle the bass in a way that he does here. Hell, I didn’t even know the guy was a bass player. Vinnie Moore is, of course, exceptional. He used to be shredder, right out the Mike Varney factory, with a huge Yngwie Malmsteen complex. Well, at least his first solo records were very Malmsteen influenced. Today, Moore is a completely different beast. The Yngwie influences are since long gone and even though the guy still can shred with the best of them, his style now is his own and he has a clearer focus on feel, passion and emotion – and the blues. The last time I saw him play was with UFO back in 2005 and he really knocked me out and he still does that with this record. Yes, all these side-projects really are a bit of an overkill these days, but this is one I can heavily recommend. Seems like power trios is the thing, with this, Winery Dogs and California Breed (Glenn Hughes, Jason Bonham, Andrew Watt) all have recorded great albums this year. 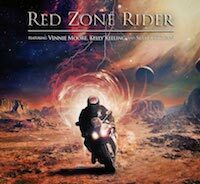 Hopefully, Red Zone Rider will turn into an actual band in the future. I for one would really love this to continue. Let’s keep our fingers crossed for that happening.